You might searching for second wrapping method for Cong you bing, I mentioned in my earlier post about Cong you Bing recipe. There are two technique for shaping the flat bread for unique layering (see the photo and follow the instructions carefully), but very easy. 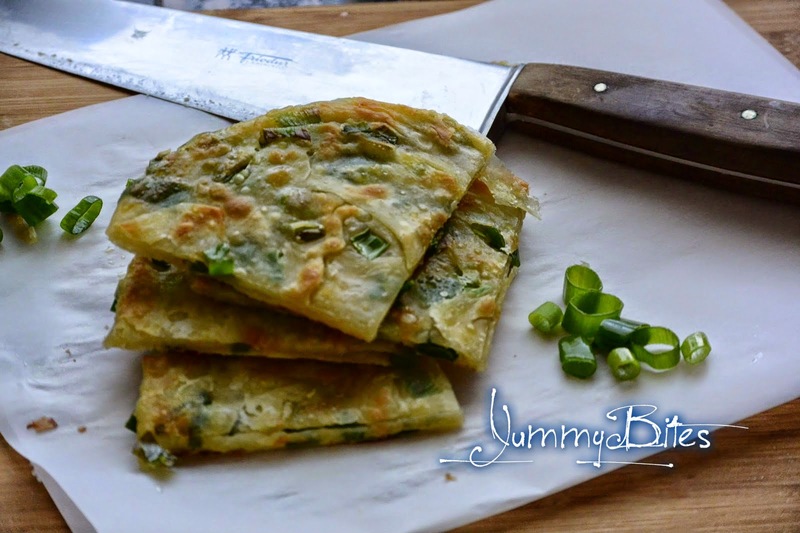 The first is by marking 6 cuts from the edge inward - click here for Chinese scallion pancake method 1 and dough recipe - While the second method illustrated under is little bit different. First the to the dough is rolled up with rolling pin, greased with oil, sprinkled with the scallions, rolled up to a tube or ciggar and wrapped around itself like for a sweet roll, then rolled out again to make flat disk with a rolling pin before laying in the hot pan to cook. The flat bread will be dotted evenly with the scallion bits of green. Complete the rest of the dough in the same manner you like and is comfortable to follow. You might want to cover the pancake with a clean cloth towel while you are working with the rest of the dough. Cut the quarters of crispy pancake and serve hot with soy sauce in breakfast or as snack over tea.